New Delhi, February 18: Traders across the country will observe a Bharat Bandh (nationwide strike) today, February 18, to register their protest against the Pulwama terror attack. Local trains, metro and other transport services may get affected due to the Bharat Bandh call. As part of Bharat Bandh agitation, traders will observe a day-long fast and take out tribute march and candlelight march in their respective states. The call for a nationwide shutdown is given by the Confederation of All India Traders (CAIT). Traders from as many as 18 states including Maharashtra, Madhya Pradesh, West Bengal, Uttar Pradesh, Rajasthan, Tamil Nadu, Punjab, Haryana, Jammu and Kashmir, and others are set to participate in the agitation. 40 CRPF personnel were martyred after a suicide bomber targetted a CRPF convoy in Jammu and Kashmir's Pulwama district on February 14. Bharat Bandh Called by Traders Against Pulwama Terror Attack, Know What’s Open And Shut on February 18. During the Bharat Bandh protest, major commercial markets in Maharashtra, Madhya Pradesh, West Bengal, Uttar Pradesh, Rajasthan, Tamil Nadu, Punjab, Haryana, Jammu and Kashmir, and others will remain shut. In Delhi, prominent markets including Chandni Chowk, Khari Baoli, Kashmiri Gate, Chawri Bazar, Sadar Bazar, Connaught Place, Karol Bagh, Rajouri Garden, Kamla Nagar, South Extension, Lajpat Nagar, Laxmi Nagar, Preet Vihar, Shahdara, Gandhi Nagar etc will be closed. "A strong sense of anger has grown among traders and citizens. The CAIT has decided to observe Bharat Trade Bandh on February 18 and no business activity will be held on that day. The bandh is organised to show the solidarity of traders with the nation and families of the martyrs," the CAIT said in a statement. "It is not an ordinary matter but a matter of our country’s prestige. Pakistan and the World should know that India stands united as ONE," CAIT stated. Pulwama Terror Attack: How CRPF Jawans Fell in JeM Trap. Although the Bharat Bandh is called by traders, unions of autorickshaw and taxi may join the stir. Transport services would be affected if protesters hold 'rail roko' or block major routes or highways. Educational institutes across the country will function normally. However, state governments may issue an order for closure if protests intensify. Banking services are unlikely to be affected by the stir. On Saturday, hundreds of people carrying placards and banners, shouting anti-Pakistan and anti-terror slogans, trooped on the roads in major towns like Virar, Nala Sopara, Vasai and adjoining Mira Road in Thane district, disrupting trains on the crucial Mumbai-Delhi Western Railway (WR) route for four hours during the peak morning time. Local train services in Mumbai's western line were also affected by protests. In the worst ever terror attack in Jammu and Kashmir since militancy erupted in 1989, a suicide bomber on Thursday rammed his vehicle packed with explosives into a CRPF bus on the Jammu-Srinagar highway in Pulwama district, killing at least 40 troopers on the spot. 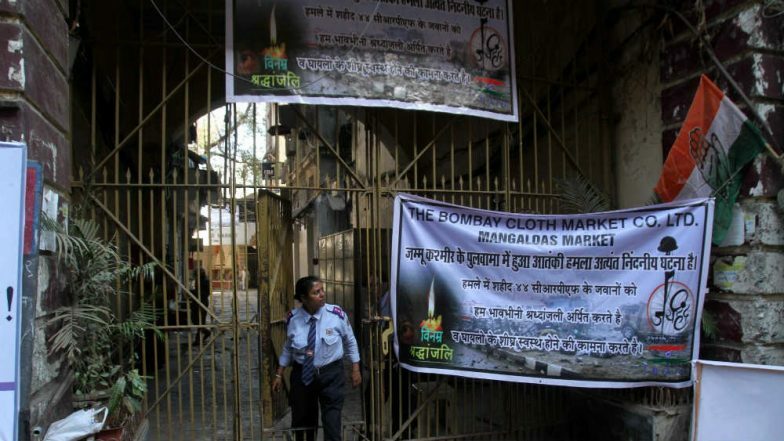 Jaish-e-Mohammed, a Pakistan-based terrorist group, claimed the responsibility for the attack.